This post is for all those who are thinking about entering the annual open competition run by the Royal Watercolour Society in 2014. 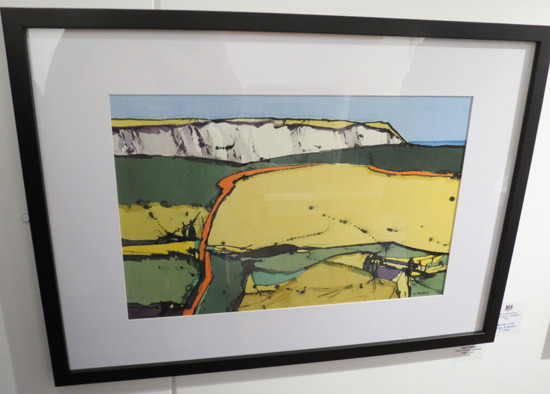 I wasn't able to get to the Bankside Gallery to see the RWS Contemporary Watercolour Competition 2013 until the last day. (a combination of the "the cough" which followed the flu and latterlly post viral fatigue!) Hence you can't see this exhibition as it has already closed. 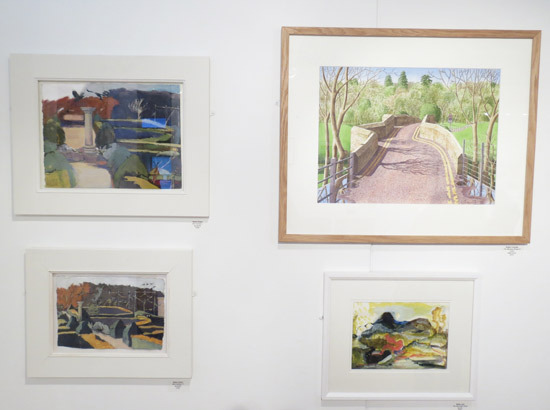 The RWS Contemporary Watercolour Competition is an annual competition open to non-Members. 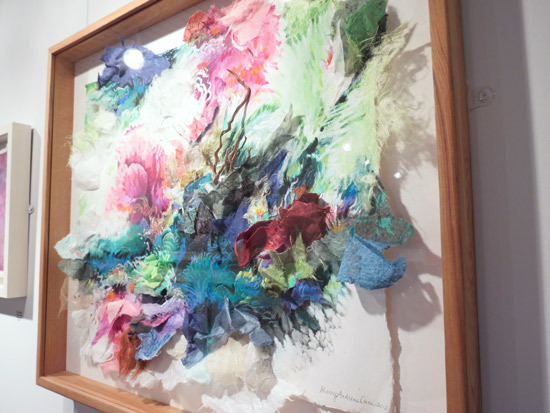 It aims to encourage innovation and experimentation in watercolour painting, spanning work on paper in watercolour, acrylic, gouache, pen & ink and watercolour mixed media. The pdf files provide listings of the images with title, name of the artist and details of size, medium and price. Note that the image on file is not the same as the actual image as some are heavily cropped. Bankside - and Tate Modern - on a Sunday (3 March 2013) is the video I took while walking along Bankside, past Tate Modern on my way to the gallery - to get you in the mood! I'm not too sure of the process used for deciding who gets a prize. One or two surprised me somewhat. impasto acrylic works are not eligible - and it was a real pleasure to walk around an exhibition which was I would call a "proper" watercolour exhibition. There were a few acrylic works but typically not ones which insisted they be viewed as acrylic as opposed to an opaque paint. I rather liked the novel and imaginative approach Debbie Ayles takes to painting construction projects - as if they were Mondrian paintings! I'd have given this one a prize. One of the things I very much like about this exhibition is that it always brings out the people who can draw in paint - typically using inks. It is so nice to see calligraphic mark-making which is one of my particular passions (can you guess from the title of this blog?). 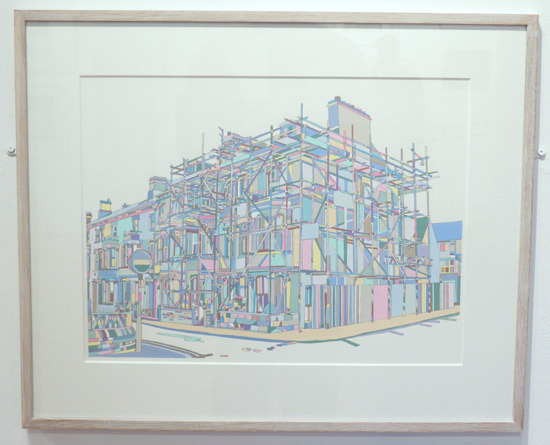 I particularly liked Max Naylor's drawing/p[ainting of Brockley in Indian Ink, I'd love to see more people submitting work using coloured inks which I've certainly seen in the past although not this year. I really liked paintings by Caroline Ali and Laura Bell. I also liked Diana Green's gouache paintings of gardens - on the left in the photo below. 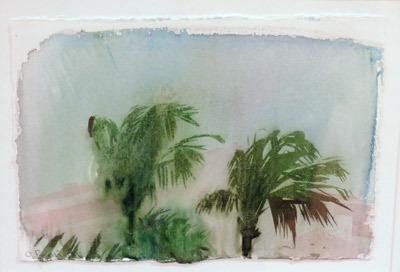 It also seemed to me that Justin Hawkes graded coloured washes was a perfect Summer 2012 Study! I visit this exhibition most years. 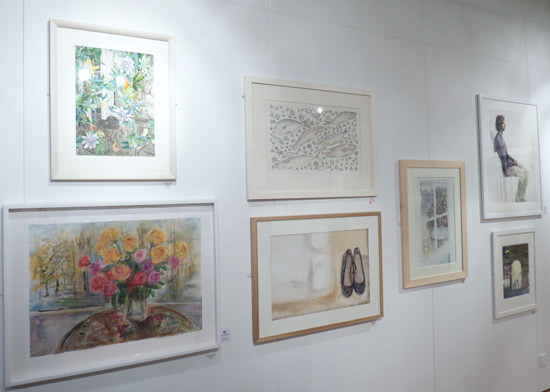 However, I have to say this year I was very surprised to see quite so many paintings which, to my mind, met the standard of a local art society but not the normal standard set by the RWS for this competition. While some were just very ordinary, others left me quite open-jawed. It struck me maybe the same view had occurred to those who hung the exhibition! In general rather a lot of work has obviously been done from photographs. I don't mind people painting from photos - but I would prefer not to be able to tell quite so easily. Essentially the difference is whether the artist takes the photo as the starting point or simply tries to copy it. 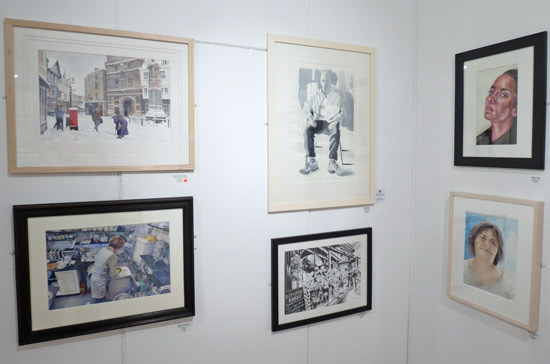 The one thought which I'm always left with at the end of these exhibitions is that, as a matter of routine, I see far superior work in watercolour in the exhibitions of the art societies which specialise in a particular subject area. Where are the high class watercolour works in miniature, of botanical art and of wildlife? 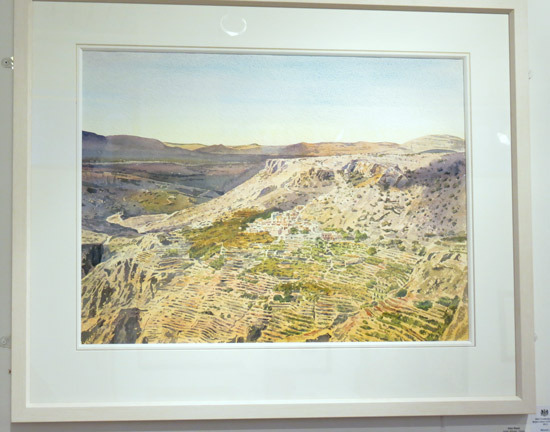 It's such a pity that the calibre of technical skill, design and composition and mature artistry that I see elsewhere is not reflected in the works typically chosen for the exhibitions by the watercolour societies (ie this is not just an RWS issue). I've asked artists from these art societies in the past why they don't put their work forward and the answer I typically get is that they don't think the watercolour societies are interested in their work. It makes me wonder whether the watercolour societies might be interested in the excellent sales records achieved by the art societies in these fields - through careful cultivation of their very enthusiastic art collectors! 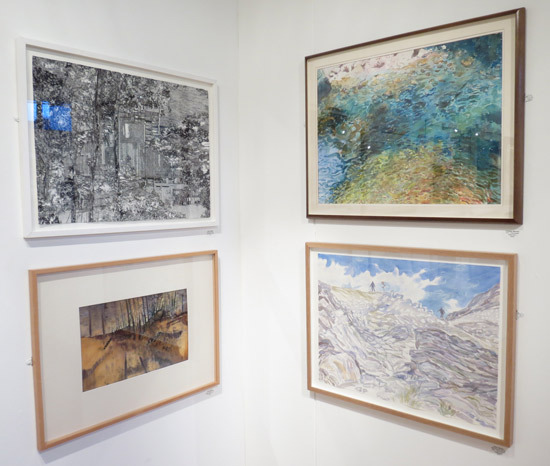 It's a conclusion to ponder on - for both the artists and art societies - particularly given the sales record of this exhibition (I counted 15 sales in total). I've often been struck by the alphabetical listings of artists - and this is one which prompts comment. I've not done the count however there are four pages to the catalogue. It's not usual for surnames starting with letters in the first half of the alphabet to comprise nearly 80% of the works exhibited. Maybe next year start the selection process at the other end of the alphabet? You can review my blog posts below about some of the previous exhibitions below. 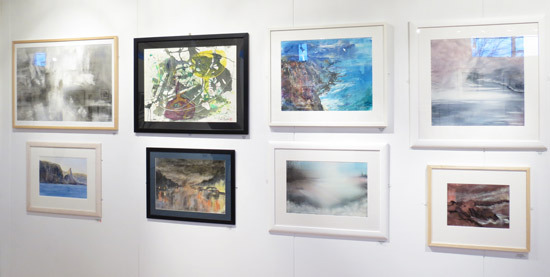 These include gallery shots of works in the exhibition and links to the websites of prizewinning artists. 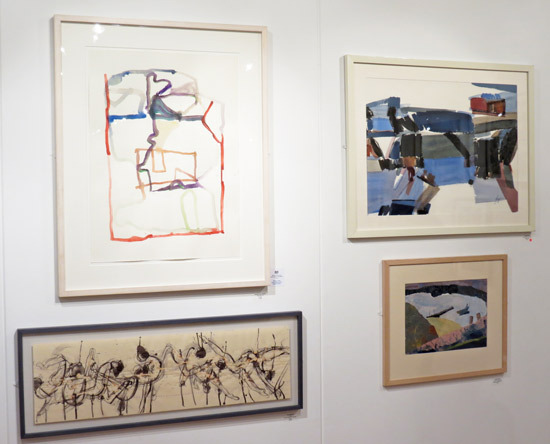 RWS Contemporary Watercolour Competition 2013 - Making a Mark 29 Oct 2012 Overview of the terms and conditions of the call for entries for UK & international artists. 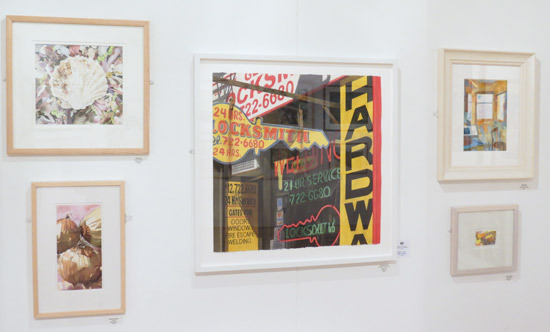 Thank you for a very interesting post.Your analysis of London exhibitions is a real boon to those of us out in the sticks and unable to attend. I was interested in your remarks about AD (Alphabetic Discrimination). I was sure it was a real phenomenon and not just my paranoia, so cheers! I'm personally waiting for Malcolm Galdwell to get round to noticing this as a phenomenon and writing about it in a New Yorker followed by yet another best selling blook! He's already identified how much a difference the date you are born makes - he's got to do surname discrimination soon! You will have noticed that I too have a surname near the end of the alphabet! Eileen Dunphy's work was a beautiful poetic piece.